1. I followed the template in Blogspot - very easy, very user friendly, that is , if you can spell. I was able to spell - divineknits with Infiknit- just fine, but then I had to spell it again - well now I know why you have to enter your e-mail twice whenever you set up an account with anyone - because they know that 75% of the world has some form of dyslexia, ADD, verbal , graphic, numeric - you name it- dysfunction and we have not even got to the second story of the house! 2. So I spelled divineknits, "devineknits". Now this would have been OK, if my first or last name were Devine. Not a bad idea at the moment - just change your name and disappear - I'll keep that one on the back burner. It only surfaced when I went to register the URL divineknits.com - taken (actually a site for children's knitwear - not bad, but not me). Then I tried a few other combinatons which were already taken, I now know why I really like the Simpsons- can I say that & still keep a readership? Finally, I followed a suggestion by Dorothy Siemens of Fiddlesticks Knitting - include Infiknit in the title - did I really want to drag that one through the mud too..? So I registered Divineknits-Infiknit.com and will eventually move this weblog over when I figure out how. 3. And so we, I - I know you won't make the same mistakes - begin again. Actually we don't have to begin all over again - there were no mistakes in the notes about Miriam and Debbie, about the teacups and the Fruit Caps. Somethings were just meant to be. But there is a "mistake" in the strawberry hat. I know it is a mistake because, I presumed that the pattern would read K 3(red), K 1 (green) when it came to do the fair isle for the "pips" in the strawberry. In fact it didn't. The original actually reads: K 7(red), K 1(green)...you be the judge, what looks better - K 3 or K 7. Perhaps, it depends on the head size? I was working with a small head size - go figure! I guess I'll just have to knit various versions - this is beginning to look like a life's work - to see at what point the design shifts. I think that I might just wait until Spring. Make a mess of strawberry shortcake and decide, if I really want to knit the hat in Berry and Loden from Fiddlesticks Knitting Country Silk or some other gorgeous yarn. 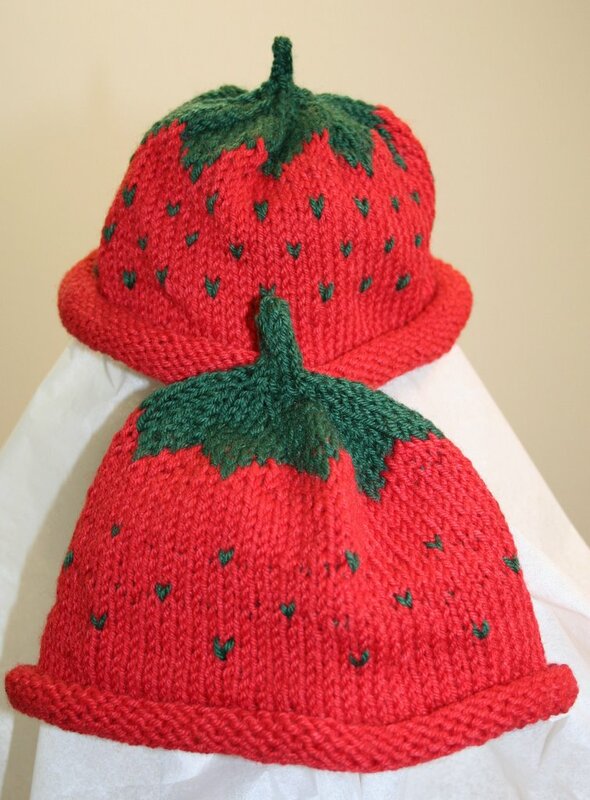 My daughter has already said that at 14 she would never wear a strawberry hat - where have all the romantics, madcaps - no pun intended- gone? However you choose to knit it, do make sure that you are working from an original pattern. There are a lot of photocopies out there. They might be free, or you might even end up paying someone else the money that should be going to the designer, for the pattern. This design and so many others from gifted designers are too precious to be cheapened by photocopying. Support the designer and they will reward you with more and more wonderful designs! I like the strawberry hat with k3 better than the one with k7. It's more lively, I think in part because the complementary colours of green dots on red background "jump" around a bit more when placed closer together.